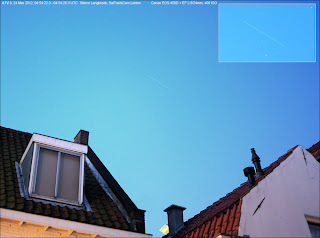 The footage above shows the European cargoship ATV 3 'Edouardo Amaldi' as it passed over Leiden this morning near 4:54 UTC (5:54 am local time), deep in morning twilight (sun at less than -7 degrees elevation only). In the opening shot, Arcturus can be seen top right, and the ATV will appear from behind the chimney-pipe of the roof below. ATV 3 was bright (magnitude 0 to -1.5) and easily visible by the naked eye. It was somewhat orangish in colour. Once past culmination, I lost it in the twilight glare to the east. The footage was recorded with a WATEC 902H camera and a 1.4/12mm lens. 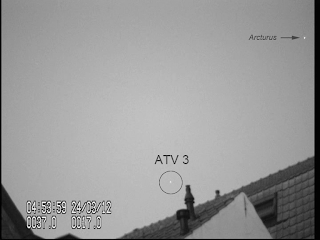 ATV 3 was launched by ESA yesterday from Kourou in French Guyana, and is on its way to the International Space Station (ISS) with supplies. I observed it yesterday morning as well, only 22 minutes after launch (see post and pictures here).